Beverly Firefighters responded to a report of a motor vehicle fire on Hart St near the Wenham line. Upon arrival, the crew of Engine 3 found a fully involved passenger vehicle. Crews stretched a hoseline and extinguished the fire. The cause of the fire, which totaled the vehicle, has not yet been determined. A firefighter and a Paramedic were rushed to the hospital after suffering allergic reactions to separate bee stings while operating at the scene of a significant motor vehicle accident. Fire crews responded to a report of a rollover with entrapment on route 128 south. The accident was found on the southbound side of route 128 between exits 17 and 18. The vehicle was on its side in the wooded area adjacent to the breakdown lane. As rescuers freed the woman from the car, bees from a disturbed nest began to converge on rescuers. Several rescuers were stung, two had to be transported to Beverly Hospital after the suffering significant adverse reactions to the stings. The firefighter was treated and released from the hospital. Information regarding the paramedic will have to be obtained through Northeast Regional Ambulance. The female victim of the crash was transported to Beverly Hospital for assessment and treatment of her injuries. A report of a bomb caused the evacuation of the Beverly High School on October 17. Students were removed from the building then escorted to two different City buildings until the threat could be ruled out. Fire crews assisted Beverly and State Police conduct a search of the building then stood by until after the threat was determined to be a hoax. Kids were escorted back to the school for class after approximately 2 hours. 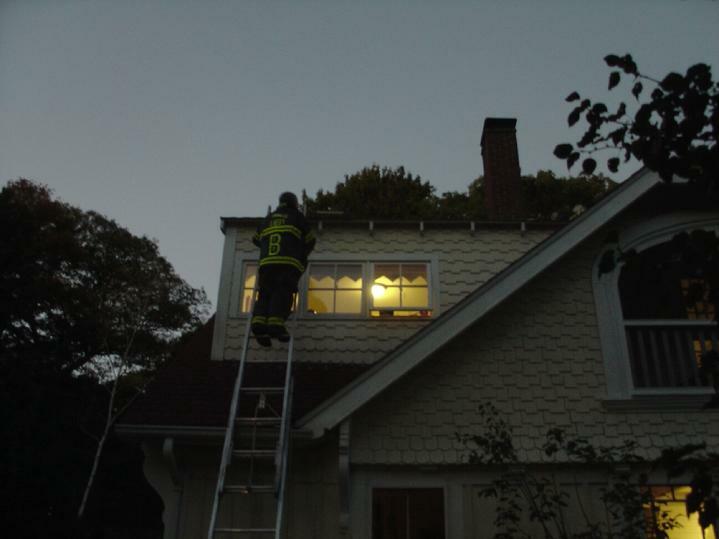 At 1740 on October 13, firefighters responded to a report of smoke in the house at 115 Valley St. Upon arrival, Engine 3 reported smoke coming from the second floor of the home. Inside the home crews found a fire in the fireplace that had extended up into the chimney showering embers out the top of the chimney onto the roof. Crews from Engine�s 3 and 1 removed the burning material in the fireplace and used special flares to extinguish the fire in the chimney. Firefighter�s Brian Miller and Tom Lantych worked on the roof to check for fires caused by extension from the chimney and embers falling from the top of the chimney. Though there was a significant amount of heat on the roof, there was no fire extension. Three people were in the home at the time of the fire, but no one was displaced due to the fire containment to the inside of the chimney. It is very important for people to have their chimney�s check by competent persons in order to avoid the ignition of built up creosote lining the inside of the chimney. Besides creosote, older chimneys are sometimes subject to failing mortar joints which allow the toxic and flammable byproducts of combustion in the fireplace to escape into the home presenting not only a fire hazard, but a significant carbon monoxide hazard. 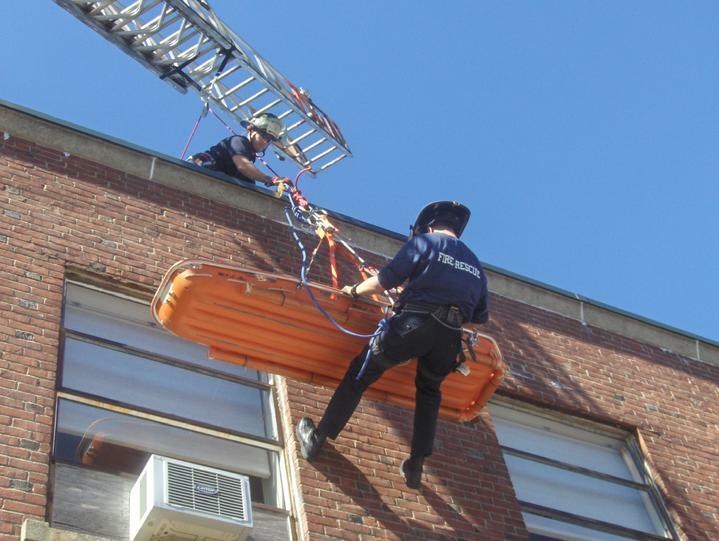 More than 1500 people visited the Beverly Fire Department Open House on Saturday, October 13. The crowds took advantage of great weather in order to see firefighters rappel off the building, practice freeing victims from mangled cars and teach fire safety topics. People that attended were also treated to everything from free pizza and hot dogs to free 9 volt batteries for their smoke detectors and face painting by Montseratt College of Art students. The turnout was so great, that over 100 pizzas and 300 Hot Dogs were served in the first two hours of the event. �This was by far the best turn out we have seen yet,� said Chief Rick Pierce �this has been a great opportunity to spread the message of fire safety.� Throughout the apparatus floor there were several tables set up with informative topics ranging from how child passenger safety and general fire safety to specialized rescue information provided by Department Rope Rescuers and Scuba Divers. Other tables displayed photos of fires and emergency scenes, radio equipment used to communicate between firefighters and fire dispatchers. At 1922 on October 11, Firefighters responded to 24 Iverson Rd for a report of smoke in the house. Upon arrival firefighters found a moderate smoke condition apparently coming from the area of a microwave oven. Crews removed the appliance to find heavy charring in the area hidden behind it. Firefighters doused the charred wood with a fire extinguisher then removed the damaged cabinet to the outside and checked the interior walls for fire extension. No extension was found. Fire investigators Robert Atherton and Paul Cotter are investigating the cause of the fire that resulted in approximately $70,000 damage.